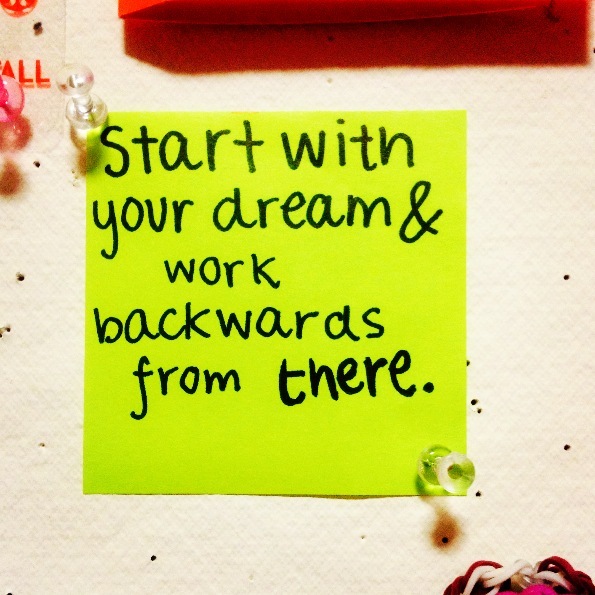 Start With Your Dream and Work Backwards From There. This Friday, Kaitlin and I sat with each other at dinner and talked. We spoke about YoungTri, about life, and everything in between. We discussed goals for the future and outlined some exciting things we have in store for YT. At the end of the dinner, she showed me a quote that she had recently found. The truth in the quote hit me — that sometimes reaching goals can seem unattainable, but working backwards from larger goals and planning step by step helps to make things more manageable. I was so inspired by the quote that I wrote it on one of my neon post-its and posted it on the wall above my desk in my room. It’s a constant reminder that things can and will get done — it just takes some working backwards. I think that it applies to all things in life — in training, in long-term goals, and otherwise — that working backwards can sometimes be super helpful. For me, I’ve thought of it this way. Write down when you imagine yourself accomplishing it. Then — delineate the steps that you need to accomplish it. Even the little things. The things that you can do (whether on a day to day, week to week, or monthly/yearly) to start going after it. Great things don’t happen in an hour. Or a day. Or even a month. Give it time. If you work backwards and stay patient, amazing things will happen. Want more inspiration on accomplishing your goals? Chrissie Wellington on accomplishing goals: “It doesn’t matter where you start”. Do you think working backwards and planning helps to reach your dream & accomplish your goals?